After a slightly delayed start the day got going. Work continued on planning Trench 3 and cleaning off the bottom of the sod layer/topsoil in Trench 1. Some small pieces of flint and animal bone were found but again the quantities were small in comparison to Trench 3. The different areas of Trench 1 were really becoming apparent now with a clear area that seems to be ditch fill. This was an area of more silty soil with less stone and corresponds well with the ‘dip’ in topography. The bank beside it is clearly visible on the surface and the excavated surface also looks different, being characterised by very compact stony layer. Beside this is an area of larger stones. These seem to cover the west face of the bank and look as if they were originally stacked up on top of the bank but slipped down over time to cover over the lower edge of the bank. All of this is carefully marked down on the plan and is also described in notes. 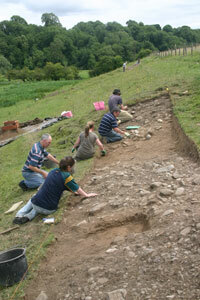 A similar sequence was emerging in Trench 1 as it was being cleaned. The image shows a view of the trench made up of a number of separate shots, stitched together as best as possible. There is some distortion because the trench is 10m long but it does show the different character of the soils from one end of the trench to the other. The view is from the north. At the right side of the picture the trench covers part of a significant bank and is characterised by a relatively compact stony layer of material. This bank is clearly visible on the ground surface. Moving to the left there is a downward slope towards a ditch. There are some large stones on this slope which may be slippage of material from the top of the bank. Towards the base of the slope there are much less stones and the soil is more silty; typical ditch fill. There is also quite a depth of topsoil above it, visible in the section (side of the trench). Moving left again past the red and white ranging rod there is more stony material representing a second bank and beyond this to the left there is another less wide ditch where the second ranging rod is located. On the far left there is a stony layer which may represent the natural ground surface. Under Matt’s watchful eye, the crew are learning fast and they did a great job cleaning off this surface. The team spirit is good and everybody is taking their turn at the different jobs, even the sieveing, which can be very dusty. When Trench 1 was fully cleaned, it was photographed and Matt got set up for a plan. 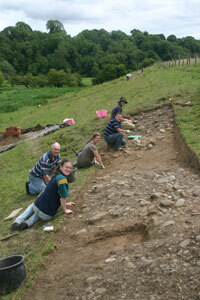 The team then moved around to start work on Trench 5, the greywacke slab.